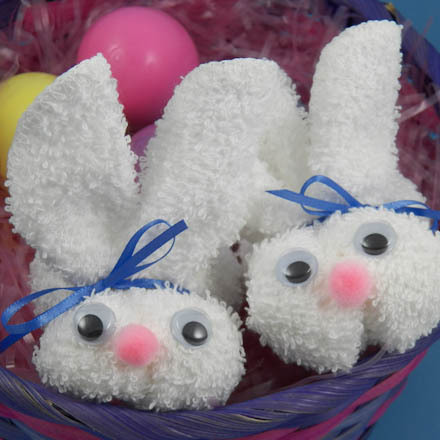 What could be more fun than making a cute little bunny for Easter? 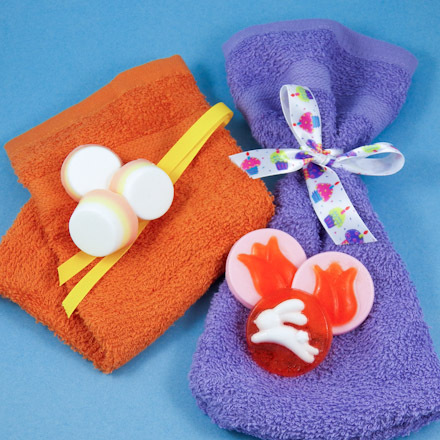 Start with a washcloth, and in no time you'll have a little sweetie to add to an Easter basket, give as a gift or use as a decoration that doubles as an Easter egg holder! This project is great for family, classroom or group craft time. With a little preparation by the adult or teen leader, this is a quick craft. Bonus idea: You could also make a bunch of bunnies to give as a baby shower gift—just leave off the eyes and nose. They go perfectly with a diaper wedding cake. Related craft: For more washcloth crafting fun, see the Washcloth Bath Bags craft project. Tip: Use washcloth bunnies to display Easter eggs. Tip: Washcloth bunnies look cute in Easter baskets. Thanks to Sandi Kern for sharing this craft idea with Aunt Annie's Craft Exchange back in 1996. Sandi commented, "I have to come up with a lot of creative ideas as a stay-at-home mother of three boys." 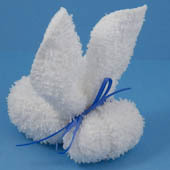 Tip: Washcloth bunnies make great baby shower gifts. 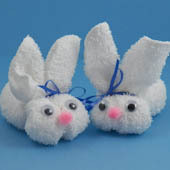 Buy a set of washcloths and make washcloth bunnies without the eyes and nose. 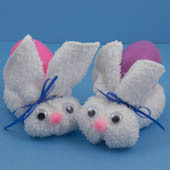 They still look cute, and the new mother can take them apart to use.